From Florence, I headed to Washington D.C. to attend the Society for Scholarly Publishing Annual Meeting (SSP) last week. This conference is a big event for academic publishers. It’s primarily attended by people who either work for publishers as well as companies that provide services for them. It also includes a smattering of librarians and technologist. 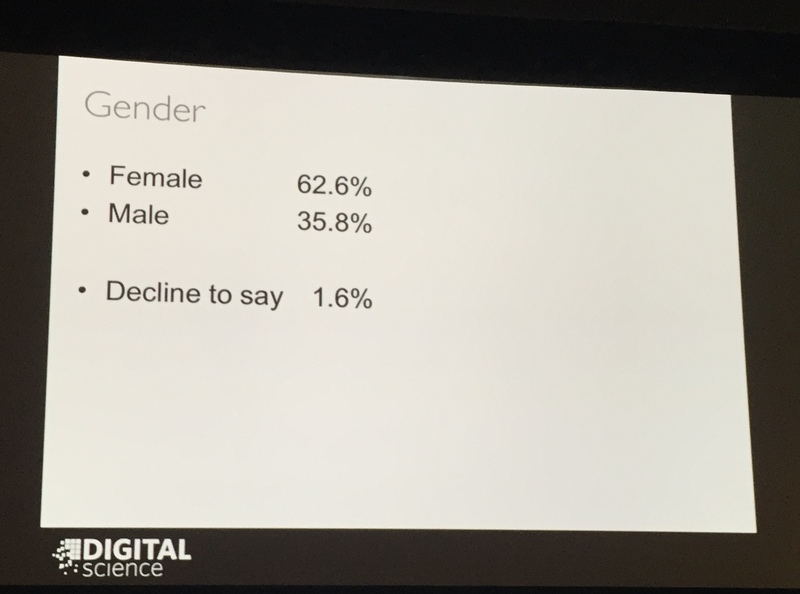 The demographic was quite different from WWW – more in suits and more women (attention CS community). 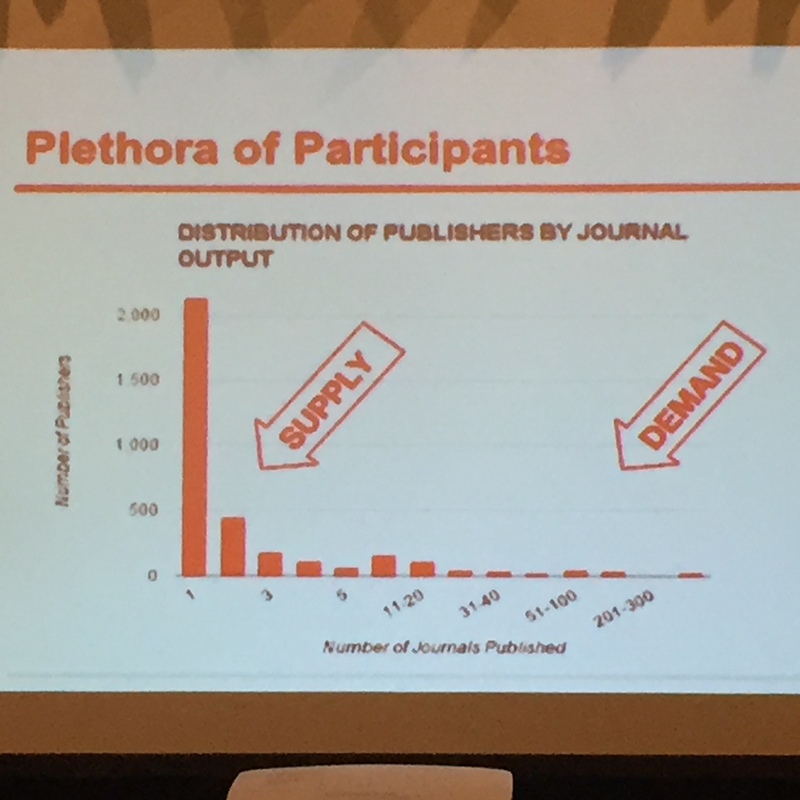 This reflects the make-up of the academic publishing industry as a whole as shown by the survey done by Amy Brand, which was presented at the beginning of the conference. Full data here. Here’s a small glimpse. I was at SSP primarily to give a talk and then be on a panel in the Big Literature, Big Usage session. The session with Jan Velterop and Paul Cohen went well. Jan presented the need for large scale analysis of the literature in order for science to progress (shout outs to the Steve Pettifier led Lazaurs project). He had a great set of slides of showing how fast one would have to read in order to read every paper being deposited in pubmed (the pages just flash buy). I followed up with a discussion of recent work on Machine Reading (see below) and how it impacts publishers. The aim was to show that automated analysis and reading of the literature is not somewhere off in the future but is viable now. Paul Cohen from DARPA followed up by the discussion of their Big Mechanism program. This effort is absolutely fascinating. Paul’s claim was that we currently cannot understand large scale complex systems. He characterized this as pull vs. a push approach. Paraphrasing, we currently try to pull on the knowledge into individuals’ heads and then make connections (i.e. build a model). vs. a push approach where we push all the information from individuals out and have the computer build a model. The former makes understanding such large scale systems for all intensive purposes impossible. To attack this problem, the program’s aim is to automatically build large scale causal computational models directly from the literature. Paul pointed out there are still difficulties with machine reading (e.g. coreference resolution is still a challenge), however, the progress is there. Amazing they are having success with building models in cancer biology. Both the vision and the passion in Paul’s talk was just compelling. (As a nice aside, folks at Elsevier (e.g. Anita De Waard) are a small part of the project.) are participating in this program. We followed up with a Q/A panel session. We discussed the fact that all of us believe that sharing/publishing of computational models is really the future. It’s just unfortunate to lock this information up in text. We answered a number of questions around feasibility (yes, this is happening even if it’s hard). Also, we discussed the impossibility of doing some of this science without having computers deeply involved. Things are just too complicated and we are not getting the requisite productivity. I attended a number of sessions that discussed the business of academic publishing. The big factor seems to be fairly flat growth in library budgets but with a growing amount of journals. This was mentioned in Jayne Marks from Wolters Kluwer’s talk as well as a whole session on where to get growth. I thought the mergers and acquisition talk from @lamb was of interest. It seems that there is even more room for consolidation in the industry. I also feel that the availability of large of amounts of cheap capital has not been taken full advantage of in the industry. Beyond consolidation new product development seems to be the best way to get growth. I think one notion that’s of interest is the transition towards Big Funder Deal where funders are essentially paying in bulk for their research to be published. 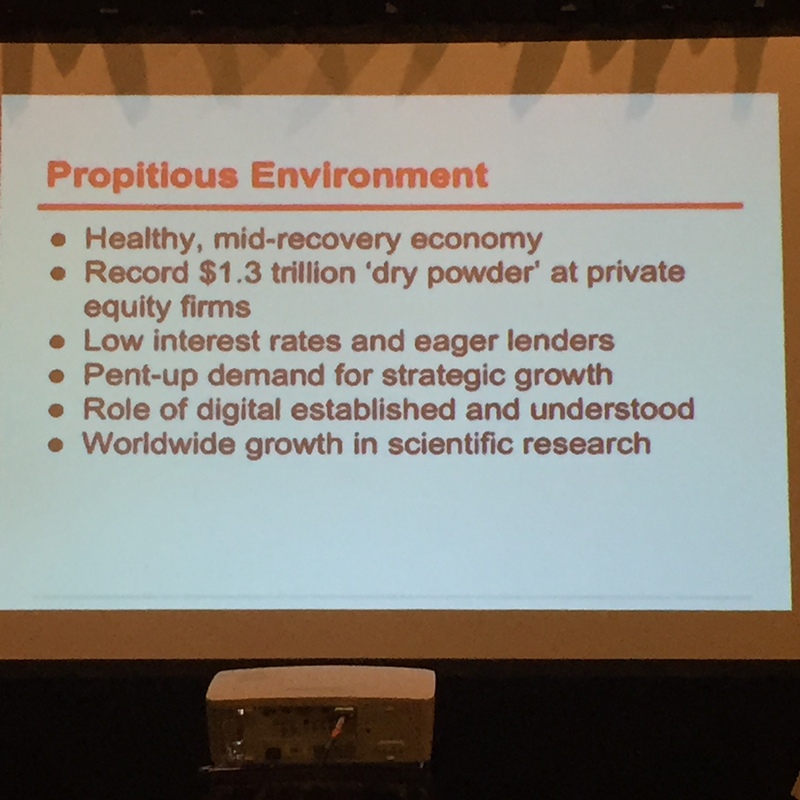 I enjoyed the cost of OA business models session. A very interesting set of slides from Robert Kiley about Wellcome Trust’s open access journal spend is embedded below. This is a must look at in terms of where costs are coming from. It is a clarion call to all publishers in terms of delivering what they say they are going to deliver. 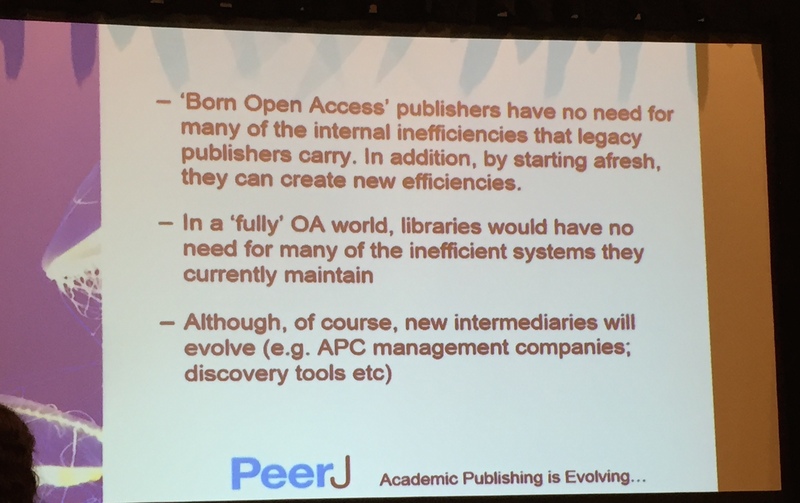 Pete Binfield of Peer J gave an insightful about the disruptive nature of non-legacy digital only OA publishers. However, I think it may overestimate the costs of the current subscription infrastructure. Also, as Marks noted in her talk 50% of physicians still require print and a majority students want print textbooks. I wonder how much this is the predominate factor in legacy costs? Overall, throughout the sessions, it still felt a bit … umm…. slow. We are still talking papers maybe with a bit of metrics or data in for spice but I think there’s much more to be done in helping us scientist do better and that scholarly media/information providers. Human factors drive more decisions in the highest levels of business than let on. Editorial and fact checking at the level of the New Yorker is a game changer for an author. He’s really big on having a calling card. I always enjoy T Scott Plutchak’s talks. He talked about his new role in bringing together data wranglers across his university. He made a good case that this role is really necessary in today’s science. I agree. But it’s unclear how one can keep the talent needed for data wrangling within academia especially in the library. Overall, SSP was useful in understanding the current state and thinking of this industry. After the Big Literature, Big Usage session Tiffany Bogich from the startup Standard Analytics introduced herself. Cool to see more machine learning/math people in the scholarly space. They’re building a scientific knowledge graph. Disappointed my blog wasn’t in the ACI Blog index. I met Rick Anderson of scholarly kitchen fame. We had a good conversation about…. what else… open access. It’s weird being somebody who actually regularly publishes at these events. The conference goes really out of it’s way to welcome people. Better than what we typically do for PhD students in our CS conferences.